This is more along the lines of navigating the landscape of the modern plant breeding intellectual property rules. I am mainly wondering if there is some list or database of varieties that have restrictions on them, from PVP to utility patents. In lettuce breeding for example, it is my understanding that it is perfectly legal to use a variety under PVP protection in further breeding work, without restriction. If you did the same thing with Breen or one of the Salanova lettuces you would be breaking the law. With the Salanova lettuces Johnny's is pretty up front about the patents and stuff, and the description of Breen does say "Utility Patent granted", but it was much more subtle a few years ago. I'm wondering if all utility patented varieties that are out there are clearly labeled as such? Is there a list? I've also just wondered on the origins of commercial hybrids, and what the intellectual property status is for using them in breeding work. 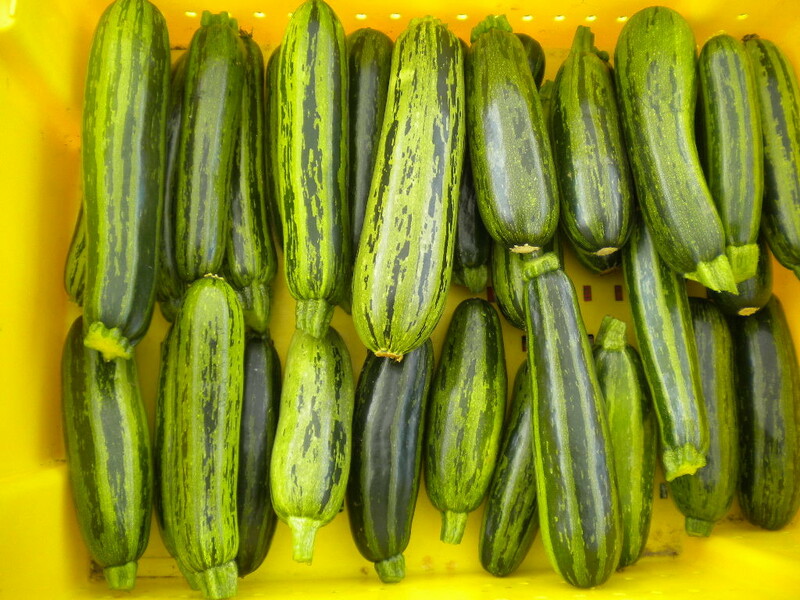 Quite a few years back now Ramondo and I collaborated on a dehybridization project of a commercial hybrid zucchini "Green Tiger" to try and create an OP version we started calling "Jade Numbat". It did always concern me that I basically knew nothing about the origin of Green Tiger, what corporation developed it was it patented etc. I didn't really know how to even begin researching it. Where do you go to look for that information? Not clearly labelled as such is my experience. Salanova lettuces, for example. At least one supplier here in Australia offers seeds but no mention is made of the utility patent, at least not that I saw. Glad I saw this post. I was considering trialling a few of these lettuces but I’ll give it a miss now. Plenty of non-patented lettuces out there to trial. My sense of the matter, is that many companies deliberately hide the patent status of the varieties that they sell. So what types of protected plant material might we acquire to breed with? F1 Hybrids: They acquire their protected status due to being a trade secret.... In other words seed companies don't tell the world what the parents are, so they are fair game for plant breeders. I made an open source F1 hybrid sweet corn this year, which I intend to carry in my seed catalog. I will publish the identities of the parents, so that anyone can recreate it on their own farms. PVP: Fair game for plant breeders. Utility Patent: Utility patents are granted for a particular trait, for example the stem may be 25% longer than other varieties. The plant isn't patented. Only one particular trait on the variety. If you make a hybrid and one of the parents contains the patented trait, and then you select against the patented trait, you would not be violating the patent. Utility patents are only valid for a few decades. So it doesn't take long before all those traits become unambiguously available for open source plant breeders. And I think that a good legal defense could me made that "The conglomerate deliberately concealed the patented status of the variety, therefore they committed fraud, and I can't be held responsible for knowing something that they deliberately hid from me." Besides, many utility patents are plain old fraudulent, because they claim traits that are commonly known in a species. Patents make much more sense on plants that are propagated for sale asexually - like rose bushes. Isn't that how it all started? Looks like the plant utility patents are unenforceable, unless the patent number is listed on every seed packet. Or unless the patent holder sends a letter to the person that is using the allegedly patented materials. And then the patent is only enforceable from the time that the letter is received. So if seed company's fail to disclose the patents, then the variety becomes fair game for use in plant breeding, until such time as the patent owner notifies the plant breeder to stop. I have a patented thornless blackberry taking over my garden. On the tag it says "May be covered by USPP# ----- or other patents." I assume this prevents me from propagating it vegetatively and selling those plants. Does it also prevent me from growing the seeds? I assume it would not breed true from seed. Does it prevent me from digging up a sucker and giving it to my neighbor? That doesn't sound enforceable to me, because "may be covered" is identical to saying, "We don't really know if this item is patented or not". And the alleged patents might already be expired. For example, when I look up Thornless Blackberry patents, I find, cultivar Arapaho, patent number USPP8510P which is expired. I wouldn't want to be the first one through the breech to test that theory. I'd say that those patents are as enforceable as all get out as long as they've got more lawyers than you. Yeah, there is a difference between what you can theoretically win and what you can afford to win. These rulings don't give us as much as it might seem. If you breed something with a patented variety and are using and selling your derived variety, presumably this means that if the source variety was unmarked, and the patent owner tells you to cease and desist, they can't recover damages from your past use and sales of the derivative. But they can order you to quit using, selling, or distributing your derivative. Maybe for the length of the patent, maybe forever, not clear which. These days, F1 hybrids are sometimes also patented, presumably specifically to discourage dehybridizing. And not just GMOs. Most hybrids are still not patented. Most seed companies do not tell us about the patents. Johnnys is an exception. There are a few they have missed, but Rob Johnston, the founder, tells me they list every patent they know about. Sometimes you can find the patent by googling "variety name, crop name, release, genetics". Back on the third or fourth page of results, with luck, you find an article describing the crops breeding and announcing it's release. However, even if you do a regular patent search and you find no patent, that does not guarantee there isn't one. Often, seed companies refer to their new varieties by breeding line numbers only in the patent. And there is no way to tell what name they are using to sell the variety. And no way to trace the variety's commercial name to a patent that covers it. The only way you can know for sure something isn't on a current patent is it's too old, or you have tracked down the breeder and asked. Sometimes we just aren't going to know. For this reason, when you apply to OSSI-Pledge a variety, the paperwork only asks you to aver that the variety is not covered by a patent or other IP to the best of your knowledge. As for plant trait patents, I don't think anyone knows what they apply to. Generally these patents are for traits that already existed or represent an obvious extension of known practice, so should never have been issued. They allow the holder of a patent for redder lettuce to sue you even though your red lettuces contain none of their germplasm. In fact, there is no way you can tell whether someone has patented a trait that is in your variety unless you did use their germplasm and they mention the patent in a variety description. I think if anyone tries to enforce such a patent, in a just fight the result would be the patent is cancelled. So I think these patents are probably unenforceable, at least against parties with equal legal teams.